Steadfast Electric has extensive experience in wiring new homes as well as commercial and industrial. Our electrical service department can do it all, from installing a ceiling fan to rewiring an entire house to bring it up to code. Isn't it time to let Steadfast Electric help you make your home more user friendly. Need to add a finished touch to your basement. We can make it look like that perfect hideaway and offer comfort to your home. Call today! Steadfast Builders has extensive experience installing cabinetry and beautifying you kitchen. We will help you design and layout you kitchen to fit your family's life style. Call today to set up an appointment for a free estimate. Steadfast Builders can design and build your new home as well as expand your existing home at a price that won't supersede your budget. When Steadfast Builders has completed your new addition the old structure and the new structure will blend beautifully. Your home and Steadfast Builders – a perfect match. Whether you need an extra bathroom or want to remodel an existing, call Steadfast Builders. From a luxurious master bath to renovating your current small guest bath, there is no job too big or too small for the experts at Steadfast! Enjoy the warm weather and never leave home! Now is the time to add that deck or porch to increase your outside living space as well as your home's value. With Steadfast Builders' custom detailing and craftsmanship, you may never want to go inside again. 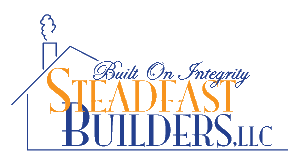 Steadfast Builders installs all major brands of windows, doors, and siding. We are experienced with custom, new construction, and vinyl replacement windows. Call today and we will help beautify your home, as well as make it more energy efficient. Let Steadfast Builders help you express yourself. Whether it be a man cave, party room, media room, or outdoor living space the creative team at Steadfast builders will create a space that you will never want to leave. Steadfast Builders is experienced in all forms of concrete. Whether it is stained and stamped concrete patios and driveways with rich colors and blends, or garage floors and side walks we can add beauty to your home. Steadfast Builders can even tackle large jobs such as parking lots. Call today! Protect your second largest investment and increase the value of your home. Add on an attached or detached garage to protect your car, and handle all your storage needs. All at a price that won't drive you away.